The best tips for growing chili peppers in container or backyard vegetable gardens. Learn how to plant chili peppers from seeds or transplants, and how to care for and harvest them. Since pepper plants adore the heat, it is a good idea to wait until June before putting peppers outside. Plant the pepper seeds or transplants outdoors when the nightly temperatures can be counted on to remain above 55 degrees. However, the plants' requirement of a long growing season makes it impractical to sow the crops from seeds directly into the garden bed in all but the warmest climate zones. Therefore, start your seedlings indoors in April, or purchase transplants from a garden center, unless you live in the tropics! Sow 2 seeds to a peat pot, ½ inch deep, and keep them in a hot, bright spot of around 75 degrees to insure proper germination and strong seedlings. About ten days after sowing the seedlings will make their first appearance. Begin a weekly feeding with a solution of liquid fertilizer and water. When it becomes apparent which seedling in the pots is the stronger one, cut off the weakling so that all of the nutrients will go to producing superior seedlings. Peppers thrive on warm weather and rich soil. Add aged manure, compost, and 5-10-5 fertilizer of about 5 pounds to 100 square feet to the planting row. When you are certain the night temperatures will not dip below 55 degrees, thin to one plant per pot. Set the chili pepper plants in the vegetable garden bed at 18 inch intervals. Provide each transplant with a protective cutworm collar. Water the transplants with a mixture of water and liquid fertilizer. If your region experiences occasional cool nights in June, wait before setting the pepper plants outdoors. When the peat pots are filled with roots and you have yet to set the plants in the garden, shift the growing chili peppers into individual 5 inch plastic pots. Shifting the plants into a bigger pot avoids stunting the growth of the chili pepper plants. By allowing additional root room, it buys you more time to wait until the weather warms up before setting the plants out. Even if it means waiting a week or so longer, the plants will continue to grow in the pots. 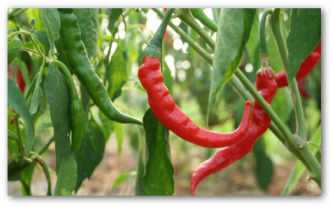 The earliest of the chili peppers should be ready for harvesting in July. Peppers have the same hot flavor at all stages of their growth so they can be harvested at any time. In other words, the peppers do not get any hotter the longer they remain on the plant. The best vegetable gardening advice for growing chili peppers successfully is to plant a variety appropriate for your area, give the plants a rich well drained soil, and a shovelful of compost under each plant for starters. Recently, officials in Berlin reported eight teenage boys, ages 13 and 14, were hospitalized after drinking chili pepper sauce more than 200 times hotter than Tabasco in a contest of who could handle the challenge. The report out of Germany stated that 10 boys were in on the dare and apparently held the competition at school. Eight of the boys were taken to the hospital after complaining of being sick. No report was made on the two young men with the iron clad constitutions that didn't complain! The Scoville scale is used to measure the hotness of chili peppers. 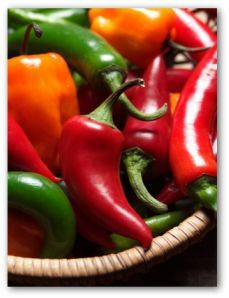 The number of Scoville heat units indicates the amount of capsaicin contained in the pepper. America's favorite, Tabasco sauce has 2500-5000 SHU, whereas the hot sauce the German teenagers drank registered 535,000 SHU. 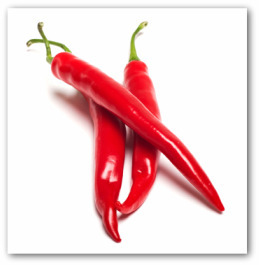 Capsaicin is a chemical compound which gives the growing chili peppers its heat. The natural function of the chemical is thought to have evolved as an anti-fungal agent for the plants.